"What I do in this life is only important if I can ease suffering of others, if I can somehow make the world a better place"
Steven Seagal is a tender hearted and unpretentious person. He likes to help people making no discrimination. 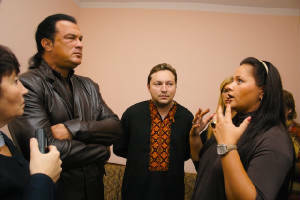 The famous Hollywood actor Steven Seagal, as was suddenly, secretly visited the orphanage "Rodyna" in the city of Boyarka. Incognito star revealed member of the party "Our Ukraine". Yesterday, September 15, "our Ukrainian" Yuri Stets (number 53 in the electoral list Block) went to visit a children's home. " "Every year on this day, I have a tradition to visit the children in different institutions and simply on behalf of journalists, friends and family to make gifts," he explained. This year, Yury visited the orphanage "Rodyna" in the city of Kiev Boyarka area up about 60 children of different age from dysfunctional families. And on the eve of orphanage director told him: "And in our guests today, Hollywood stars ..."
It soon became clear that Kiev guests accidentally uncovered incognito Steven Seagal, who was in the Ukraine, not giving any press conference, said the site "Raz." 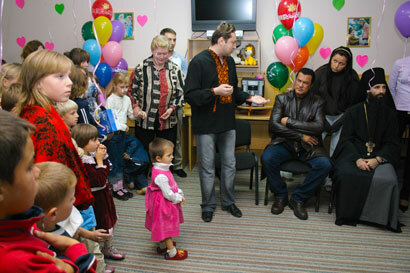 Steven Seagal comes to children with a television and toys.All gifts too, he thanked himself. And from Yuri Stetsya that day fluent received sweets and book publishing "A basic small base Ga la ha, which is headed by John Malkovich. 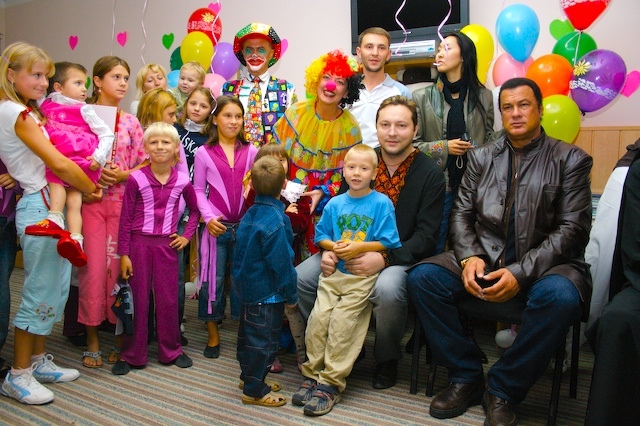 Also Yuri Stets brought to the child asked, to which children watched with him and Seagal. "Everyone who thinks his life happy to share their piece of happiness with another person," said Yuri Stets, referring to the children and caregivers. "I am impressed that our Ukrainian children not only Ukrainian policy and business people, and come and visitors from other countries. 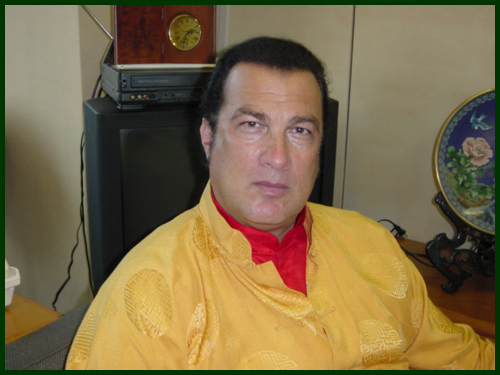 I am astonished to see today in the orphanage Steven Seagal. I am very pleased that a famous Hollywood actor is charity in Ukraine." Yuri Stets promised that the initiative journalists "5 channel" is not the first and not the latter: "This is not the first nor the last children's home, which we visit." "Save a Million Lives" is making an impact on HIV/AIDS in Africa. 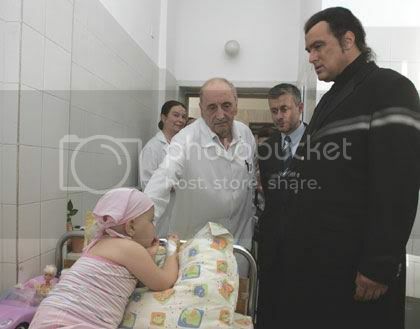 Steven Seagal visits patients of the Bakulev Cardio-Vascular Surgery Center in Moscow, May 21, 2006. 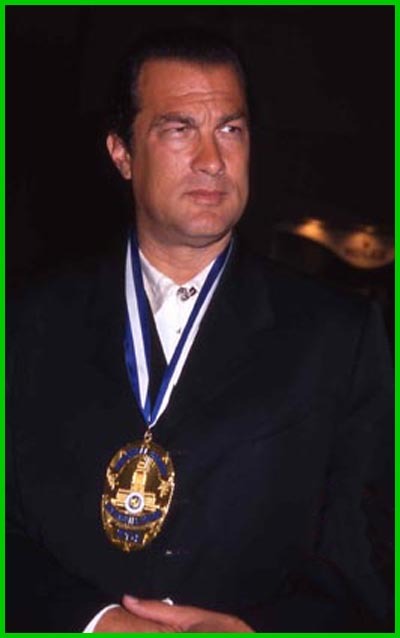 Seagal arrived in Moscow to attend The International Golden Heart Prize award ceremony for the "Service to the highest ideals of mankind"..
Did you ever see any good look like this !!! 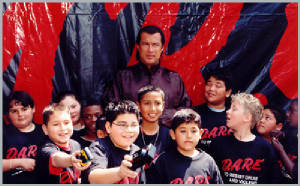 American action-movie star Steven Seagal met a group of children from an orphanage to promote the campaign "Be Intelligent, Not Violent!" initiated by the Bucharest police. According to a press release, the ten children were invited by the actor to attend the shooting of several scenes from the film "Enemy of the Unseen," Seagal's latest action flick, which is being filmed in Romania. Seagal, an actor who has mainly played in violent movies and is also known for his skills in martial arts, said his intention was to prove to children that the "fights" in the movies are not real and that violence is always defeated by intelligence. The photos of the American actor and the children will be used in the production of educational material for students and posted on the campaign's Web site www.stopviolentainscoli.ro. "Be Intelligent Not Violent!" 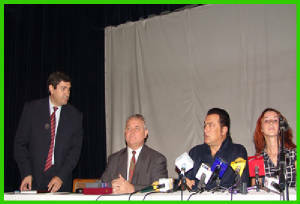 was launched by the Bucharest Police and the Bucharest School Inspectorate and is aimed at deterring violence in schools. The initiators of the campaign want to involve as many public figures as possible in the fight against school violence. Steven Seagal decided to make a film at New Orleans and Gulf Coast area. Then he became member Rebulding of New Orleans & LA Community and he donated 250.000 $ for Children Hospital in New Orleans with Jefferson Parish Sheriff Harry Lee, singer Willie Nelson..
Before and during the Mardi Gras activitions he attended concerts and parades. 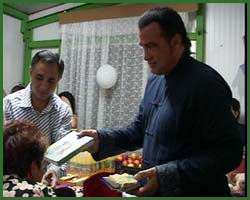 During the Hurricane of Kathrina, Steven Seagal was filming in Romania. When he finished his worked he run to New Orleans for to help victims of hurricane.. He helped an old friend -a sheriff - and helped SWAT team with their badge.. Besides helping human, he also works for the Peace of the World. Actor and life-long musician STEVEN SEAGAL will lead the way as the first individual to personally sponsor the disarming and disposal of a "high risk" Russian nuclear missile with a donation of $100,000. 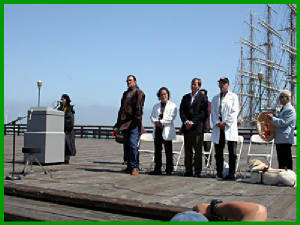 SEAGAL will mark the event by hosting the "Full Circle" ceremony Saturday, July 16th in San Francisco where the "Atomic Flame" will arrive from Japan aboard the Nippon Maru. The "Flame" was kindled from the burning embers of Hiroshima 60 years ago, after the world's first atomic bomb was dropped. Protected by Zen Monks, the original flame still burns today and has become a symbol of hope for peace and a reminder of the horrors of nuclear weapons. Joined by peace groups from around world, the monks will walk 1600 miles from San Francisco to Trinity Test Site in Alamogordo, New Mexico. Once returned to its origin, the flame will be extinguished, closing a 60-year circle of fear. A long time resident of Japan, SEAGAL says, "I have been blessed to know many survivors of Hiroshima and Nagasaki, and their spirit for living drives my determination to make this world a safer place." He continues, "30,000 nuclear warheads still exist today with 100,000 times more destructive power than Hiroshima. It's our responsibility as global citizens to rid the world of this imminent threat." Dr. Bruce Blair of the multi-national Center for Defense Information in Washington, DC echoes this threat in today's precarious world: "In the age of cyber terrorism, high security hacking makes the reality of an unintended nuclear exchange a stone-cold possibility." Mikhail Margelov, chairman of the Russian Federation Council International Affairs Committee supported the idea of a global fund to help accelerate the destruction of nuclear weapons. "It gives the Russian government an opportunity to show their leadership and commitment to disarmament issues." 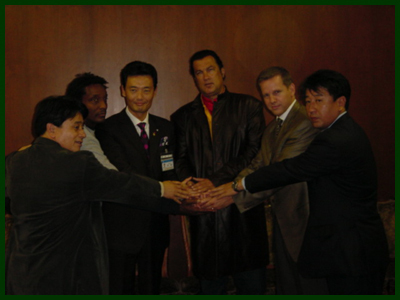 The popular mayor of the city of Yokohama Hiroshi Nakada, welcomed international action star / musician Steven Seagal together with a delegation from the GND Fund, to the city in a formal meeting attended by members of the press. 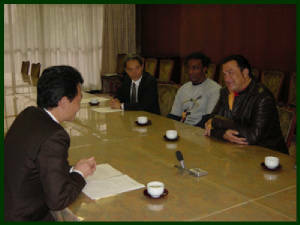 During the meeting Mayor Nakata expressed his sincere gratitude to Seagal for championing a cause so dear to the people of Japan, and pledged “full support” from the city that was the site of the surrender treaty ending WWII, of the efforts made by Seagal and the GND Fund to destroy nuclear weapons. At the end of the official meeting Mayor Nakata presented an official proclamation commending Seagal as the first private citizen to destroy a nuclear weapon. A gala dinner in honor of Actor / Musician Steven Seagal for his role in becoming the first private citizen to sponsor the dismantlement and destruction of a nuclear weapon was held in the Ballroom of the Westin Tokyo Hotel last night. The list of distinguished guests was a who’s who of Japanese culture and society including sports legend Ramos, cultural icon (check name), politicians from both the LDP and JDP, and Japanese philanthropists. Hosted by the Kaiyo Group whose charitable work in paving the way for a barrier free Japan for the disabled, the gala raised $300,000 to destroy three nuclear missiles through the work of the Global Nuclear Disarmament Fund. Steven Seagal, who was in Tokyo promoting his new record release “Songs from the Crystal Cave” (Sony Music Japan) entertained the crowd with a jaw-popping performance of authentic Delta-Blues bringing the lucky audience to their feet. 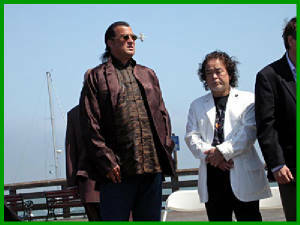 “he’s an amazing Blues musician” said Blue’s enthusiast / philanthropist Yoji Iwaoka, who had previously matched Seagal’s personal contribution of $100,000 to destroy a nuclear weapon. Himself becoming Japan’s first private citizen to respond to the public challenge to all global citizens made by Seagal to help destroy nuclear weapons months earlier. 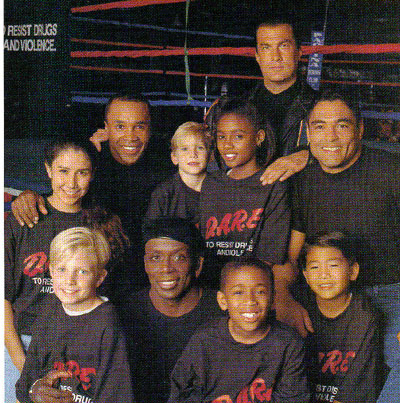 ABOUT D. A. R. E.
Superstar Steven Seagal is also father and he likes to help children all over the world..
Action movie star Steven Seagal has won a special place in the hearts of ailing brothers Roopesh and Bhavesh Ramjee of Malabar, Port Elizabeth. Seagal who was filming Mercenary in Cape Town, surprised the brothers suffering from a rare genetic bone disease, with a telephone call to their home last week. Bhavesh, 23, an avid Seagal fan, had asked his parents to contact the Red Cross hospital in Cape Town where the movie star was due to visit. “We phoned the the hospital PRO, who took our details. 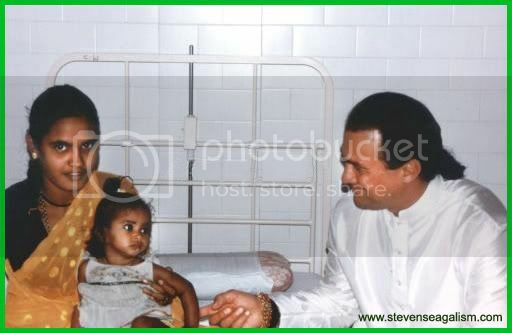 We were pleasantly surprised when Seagal phoned us back personally to chat,” said their mother, Champa. Seagal was calling from a cellphone while driving to the airport to board a plane out of South Africa after spending months filming in Cape Town. Seagal can be heard saying on a recording of his telephone conversation with Bhavesh: “Thank you very much for watching my movies. “Nice speaking to you . . . we will get together next time. Thank you very much . . . I send you boys my love and respect,” added Seagal. The brothers’ telephone conversation with Seagal was just another in a long list of stars they have been privileged to meet. Among them are Bollywood stars Atshay Kumar, Rani Mukherjee, Sharukh Khan – and Amitabh Bachchan, whom they met in 1999. Disappointingly though, a trip to Disneyland co-ordinated by the Reach for a Dream foundation had to be cancelled when Bhavesh fractured his kneecap while being helped into a taxi in London in 1995, en route to the US. Steven Seagal visited Finkelela Children's Hospital !! Children buying trainers from the Red Cross Children's Hospital Heels of Hope programme have some very big shoes to fill - including those of Hollywood action star Steven Seagal. 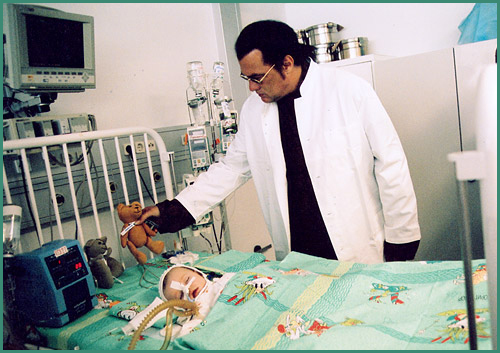 Seagal, who has been in Cape Town for several months filming Mercenary, visited the hospital and the Finkelela Children's Centre in Khayelitsha yesterday (May 11,2005). He handed over a pair of used shoes for the Heels of Hope programme, which aims to recycle 50 000 pairs, raising R250 000 for the hospital. Dressed in a brown-and-gold silk mandarin jacket and accompanied by an entourage of 15 assistants, bodyguards and Buddhist monks, Seagal toured the hospital and met several children. 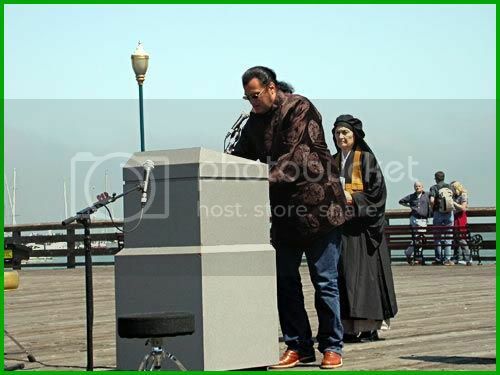 "My devotion to the children stems directly from my devotion to the Divine," Seagal said. "The Buddhist philosophy is to put others before ourselves." Despite having just had a dose of chemotherapy, Jade Smith, 13, was all smiles when Seagal visited her in her ward. The Red Cross Children's Hospital has 300 in-patients and treats "hundreds of thousands" of outpatients a year, according to its communications manager, Helen White. Staff deal mostly with chronic diseases. Michelle Edkins, a pain resource nurse at the hospital, spoke to Seagal about her work and said later that he had seemed very interested. "I got a sense that (Seagal) understands a lot of the suffering these children are enduring," she said. Dozens of children were waiting for him impatiently.He arrived around 10 pm, 3 hours later. He was expected traditionally with bread and salt, and applause. After his arrival he strated to offer the gifts to the children. He appologized for being late. The traffic and the production company who obliged him to work until late. "I've lost an hour in traffic, but I am here, as I promissed, and I'm happy and honoured to bring some joy to these children". The manager of the center said that all children were happy for this visit, they saw Steven Seagal in so many movies and they were eager to see him. The Minister of Foreign Affairs Solomon Passy and the American Actor Steven Seagal visited today the Specialised Paediatric Oncohaematological Clinic of the Queen Giovanna University Hospital in Sofia. Minister Passy and Steven Seagal met with more than 20 patients in the Clinic and talked with them. The manager Professor Dragan Bobev showed the guests the bone marrow transplantation ward, the reading room and the garden of the Clinic. The famous American actor and Minister Passy expressed a wish to make personal donations to the reading room, to the new boarding house in which children undergoing outpatient treatment and their parents will be accommodated, as well as for other needs of the Clinic. "I wanted to put a smile on the faces of these children. My friend, Minister Passy, came for the same reason," Steven Seagal said after the meeting. "However I am not the real star here, the real star is Professor Bobev who has devoted his life to these suffering children," he added. Minister Passy thanked Steven Seagal for his commitment to the pain of the children and expressed hope that his visit would attract more attention to the social problems and especially to the problems of children. (118 miles) northeast of Bucharest, August 6, 2005. 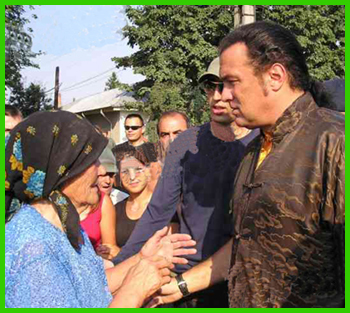 Seagal handed over a convoy of goods from an auction to raise funds for the victims of a flood that hit Romania a month ago. Steven Seagal visited a rehabilitation center for children in MexiCo, built with the funds gathered by the 'Telethon' program. 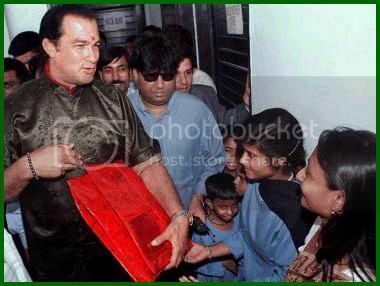 Steven Seagal is greeted by residents of a home for destitute and street children in New Delhi on April 27. The home, run by a non-governmental organization, looks after the basic needs of more than 3,000 children across the country. SASHI 2001, dubbed 'the experience', kicked off at the ballroom of the upscale Ritz Carlton Hotel, Rose Hall, Wednesday night, with a well attended awards dinner which saw the presentation of five major awards to individuals who have made significant contributions to the nation especially in the field of entertainment. Despite the late start, the approximately 700 guests, which consisted of a selected group of both local and overseas invitees representing the field of music, fashion, politics, commerce and film, left the ballroom at about midnight feeling satisfied with the night's proceedings. 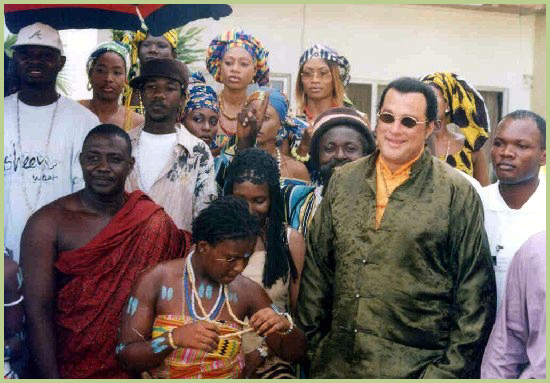 Actor-turned-musician, Steven Seagal received the Sashi 2001 Humanitarian Award for his sterling contribution to the Sir John Golding Rehabilitation Centre, Mona. After accepting the award, Seagal expressed his gratitude to the Centre's management for giving him the opportunity to serve at the institution. Said the actor, who has played lead roles in several movies: "For me, money and fame are not the greatest things in life. Instead it is my ability to help others that really matters." 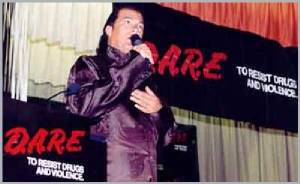 He also organized campains and charities on animals..
Steven Seagal has been an outspoken opponent of animal cruelty. Steven has described his activism method as "shaming companies into changing." He has worked with PETA to discourage the fur trade, and has written to the Prime Minister of India to seek increased legal protection for cows. 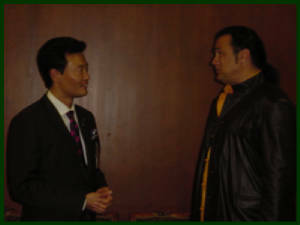 Seagal worked effectively towards saving dogs destined to drown in Taiwan; he singlehandedly pressured the Premier of Taiwan to sign legislation limiting animal cruelty. He also prevented the export of baby elephants from South Africa to Japan. 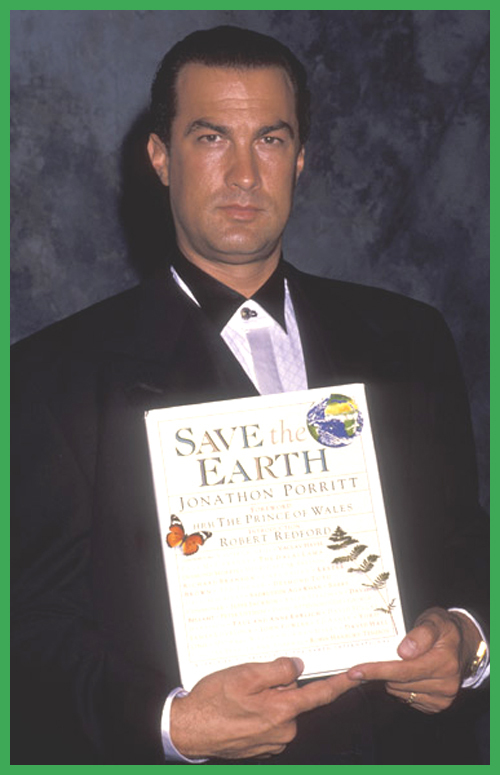 For these and other efforts, Seagal was awarded a PETA Humanitarian Award in 1999. This activism has not diminished in recent years. 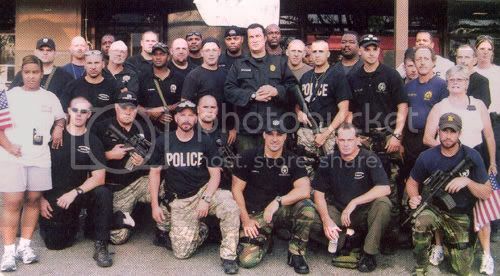 In 2003, Seagal wrote an open letter to the leadership of Thailand, urging them to enact law to prevent the torture of baby elephants. Hollywood action Superstar Steven Seagal has written a letter to Thai Prime Minister Thaksin Shinawatra urging him to order a stop to the "systematic torture" of baby elephants, the English-language newspaper The Nation reported on Tuesday. Seagal referred to a recent accusation by representatives of People for the Ethical Treatment of Elephants (Peta) that young elephants were allegedly routinely mistreated to make them "compliant" so they could be used as attractions in tourist entertainment facilities. "One hundred years ago Thailand had 15 000 elephants. Today there are only 5 000, the majority of which are in private hands," the action-movie actor wrote according to the newspaper report. He asked the prime minister in his letter to "immediately enact laws to abolish their use and abuse by the entertainment industry". Peta activists say the elephant-training ritual, known as "phaajaan", involved forcefully separating young elephants from their mothers, confining them to tiny wooden cages, depriving them of food and water and beating them with nail-studded sticks to prepare them for a life of servitude in one of Thailand's many elephant camps. Local elephant handlers denied the torture allegations, saying the ritual had been proven over hundreds of years as an effective, but not necessarily cruel, means to accustom young pachyderms to humans and "taking the edge off a potentially dangerous, wild animal". Traditionally, elephants have been highly revered in Thailand not only as domesticated working animals in the forestry industry but also as a symbol of the Thai monarchy. 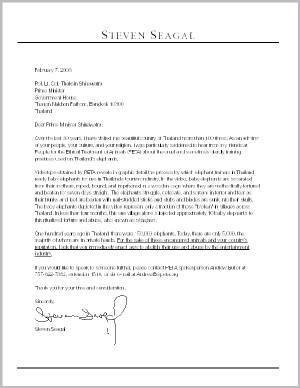 A Peta report on the alleged torturing ritual, which appears to have formed the basis of Seagal's letter, met with strong denials from both the government and local handlers when it was released several weeks ago and also posted on the Internet. 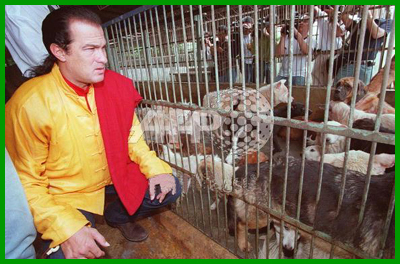 Steven Seagal displays an unhappy outlook when visiting a private shelter for stray dogs outside. 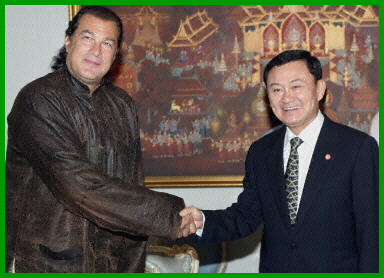 Seagal, who arrived here last week to promote Buddhism, called for better education of the public not to desert dogs. I mentioned a few of Steven Seagal's charities above but, there are so many more..
Steven Seagal is a man to be admire.. ! !